Located in the historic Five Points neighborhood, FLEX Yoga + Barre offers a variety of morning, daytime and evening yoga and barre classes. The 3,000 square foot studio is home to two studios (barre studio + hot yoga studio) and provides locker rooms with showers, and therapy suite. Parking is available in the Five Points Plaza parking lot as well as in our overflow lot on 28th and Welton. Street parking can be found throughout the neighborhood. Located at 23rd Avenue and Oneida in the Oneida Park Shopping Center. At FLEX Yoga + Barre Park Hill, you'll find our spacious studio with heated and non heated yoga, barre, pilates, HIIT classes, and much more! Parking lot parking, as well as street parking are available. Christy has always been fascinated with staying active and fit. Growing up, she participated in high school and collegiate swimming, receiving a four year athletic scholarship to the University of Illinois at Urbana-Champaign. After college, she followed her love of fitness and the outdoors to Colorado where she earned a Master of Education from Regis University and at the same time became a certified yoga instructor. She found learning about, teaching and practicing yoga grounding, purposeful, and exhilarating. Along the way, Christy enjoyed other avenues for physical fitness--training for and running marathons, mountain biking, skiing, and even completing an IronMan triathlon in Couer d’Alene, Idaho. During her wellness exploration, Christy found and fell in love with barre fitness, finding the strengthening, toning, energizing aspects of barre exactly what her body was looking for and she became Barre Forte certified. Christy taught middle school and high school science while teaching yoga for 9 years before deciding to fulfill her dream of opening her own yoga and barre studio. Sarah is a born and raised Colorado native with a passion for fitness! Her love for exercise and athletics started at a young age when she became excited by exploring and embarking on new ways to be active. Sarah attended Muhlenberg College where she played both varsity golf and lacrosse. In 2013, Sarah earned her Master of Science degree in Exercise Science and Health Promotions with an emphasis in Fitness and Wellness. After teaching and participating in functional fitness and coaching lacrosse, Sarah was eager to find a new exercise style that met her fitness needs. After her first barre class, Sarah was hooked (and incredibly sore! ), and became Barre Forte certified. Sarah is also a certified Pre + Post Natal Corrective Exercise Specialist and enjoys working with the pre + post natal population. Sarah is excited to share with you her love of fitness, wellness and health and hopes to see you in the studio soon! Christy and Sarah met while working in education. 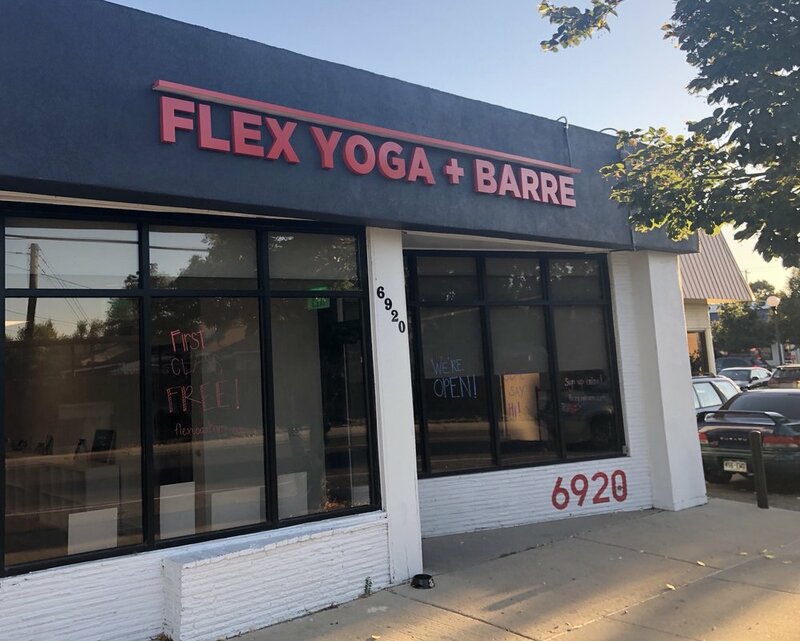 Their shared love of fitness and wellness inspired them to embark on their dream of making fitness available to everyone in their community, thus the Flex Yoga + Barre spark was ignited. Christy and Sarah couldn’t be more excited to have found the perfect spot in the historic Five Points and Park Hill neighborhoods. They are inspired by the people, energy, and unique history of each community. Flex Yoga + Barre uses fitness and wellness to bring people together and to inspire the community to find grace in the journey of falling, growing, and embracing imperfection on the path to a healthier lifestyle.